A unique celebration of the divine feminine and women’s critical role for a clean and sustainable India took place in Vindhyachal, Uttar Pradesh recently. Tens of thousands of women from local village communities gathered with great excitement and enthusiasm for the Shakti Sammelan, focused on women’s empowerment and upliftment. 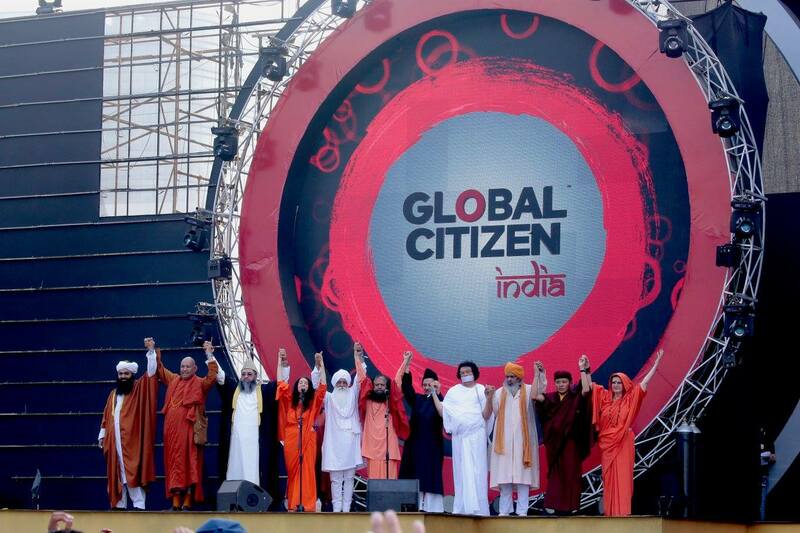 The mega event’s concluding session was attended by women from villages across Uttar Pradesh graced by the presence and inspiring words of HH Pujya Swami Chidanand Saraswatiji, Co-Founder of the Global Interfaith WASH Alliance, President of Parmarth Niketan (Rishikesh), and Sadhvi Bhagawati Saraswati Secretary-General, Global Interfaith WASH Alliance, President of Divine Shakti Foundation. The Central Government Union Minister of State for Health and Family Welfare, Ms Anupriya Patel traveled from Delhi for this special event. The Global Interfaith WASH Alliance’s (GIWA) team and WASH on Wheels information, entertainment and behavior-change campaign truck and street show puppets also traveled to Mirzapur from the villages of Bihar where they have been traveling from large cities to small villages since October, teaching local villagers and townspeople how to lead their own communities towards a Swachhta Kranti or Clean Revolution. The WASH-on-Wheels programme is one of GIWA’s many efforts to end open defecation and bring about improved water, sanitation and hygiene in India through its vast array of initiatives, including the World Toilet College, WASH on Wheels, WaterSchools and Women for WASH programmes. The Maha Shakti Sammelan (mega event celebrating the divine feminine), held in the sacred town and home to the sacred and ancient temple of the Goddess, Maa Vindhyavasini, included colourful video presentations, musical recitals and dramatic performances as well as a mass pledge led by Pujya Swamiji and Sadhvi Bhagawatiji to work to ensure universal access to safe water, sanitation and hygiene.